NASA's Terra satellite passed over Tropical Storm Katia as it was developing along Mexico's east coast. 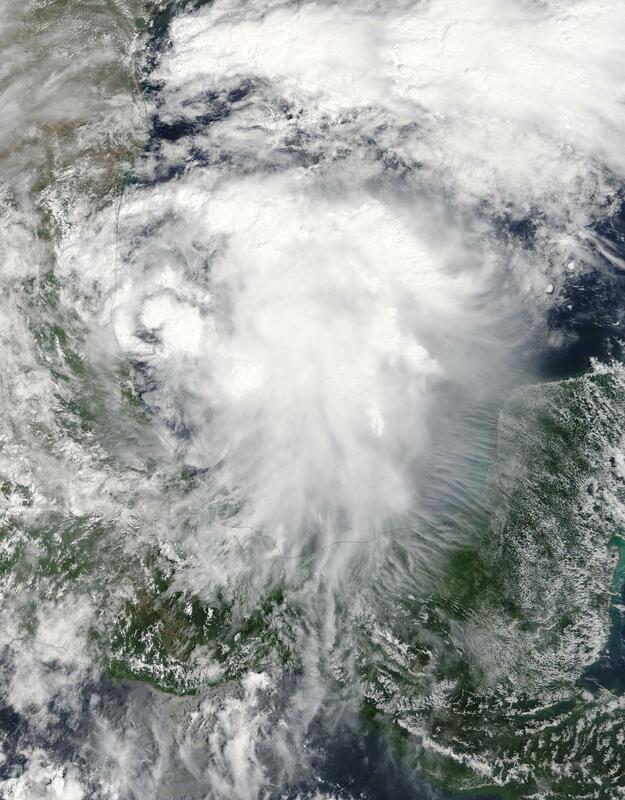 On Sept. 5, the thirteenth tropical depression of the Eastern Pacific Ocean hurricane season formed about 80 miles (125 kph) east of Tampico, Mexico, in the western Gulf of Mexico. The Moderate Resolution Imaging Spectroradiometer or MODIS instrument that flies aboard NASA's Terra satellite captured a visible-light image of the depression as it was organizing on Sept. 5 at 1:10 p.m. EDT (1710 UTC). The image showed that deep convection and thunderstorms were forming over the center. By 4 p.m. EDT, the National Hurricane Center noted that the depression had formed. At 10 a.m. CDT (1500 UTC), the center of Tropical Storm Katia was located near 21.7 degrees north latitude and 95.9 degrees west longitude. Katia was moving slowly toward the east-southeast near 5 mph (7 kph), and little motion is expected during the next day or so. Maximum sustained winds are near 45 mph (75 kph) with higher gusts. Strengthening is forecast and Katia could become a hurricane before it approaches the coast of Veracruz in a couple of days. The estimated minimum central pressure is 1004 millibars. Because of the close proximity to land, the National Hurricane Center cautioned about the heavy rainfall the storm is expected to generate. Katia is expected to produce total rain accumulations of 5 to 10 inches over northern Veracruz, and 2 to 5 inches over far southern Tamaulipas, northeast Puebla, and southern Veracruz through Saturday morning. Isolated maximum amounts of 15 inches are possible in northern Veracruz. This rainfall may cause life-threatening flash floods and mudslides, especially in areas of mountainous terrain. For updates from the National Hurricane Center, visit: http://www.nhc.noaa.gov.